Graduate in law (Lisbon, 1975). Legal expert and counsellor (1976-1999). Adviser and assistant to the Ministry of Education (1987-1991). 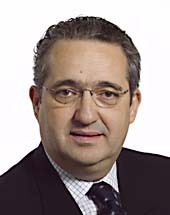 Member (1988-1990) and Chairman (1990-1991) of the inspection board of RTP (Portuguese Radio and Television). Member of the Higher Council for Social Policy of the Ministry of Social Affairs (1988-1990). Legal adviser to the Ministry of Labour and Social Security (since 1991). Between 1991 and 1999, held a number of managerial posts at TVI. Practised as a lawyer (1999). Member of the Administrative Committee (1979-1983) of the CDS and the CDS-PP (1998-2003); member of the CDS-PP Executive (2004-2005). Chairman of the CDS-PP (April 2005 - April 2007). Member of the Odemira Municipal Assembly (1982-1985); member and Chairman of the Sintra Municipal Assembly (2002-2005). Member of the Assembly of the Republic (1976-1983 and 1999); Vice-Chairman of the CDS parliamentary group (1981). State Secretary in the Deputy Prime Minister's Office (1980-1983). Contributor to various newspapers (since 1974). Vice-Chairman of Sport Lisbon e Benfica (1997-1998).